This week’s sketch is a site plan from a project we are working on in Pacoima, CA. 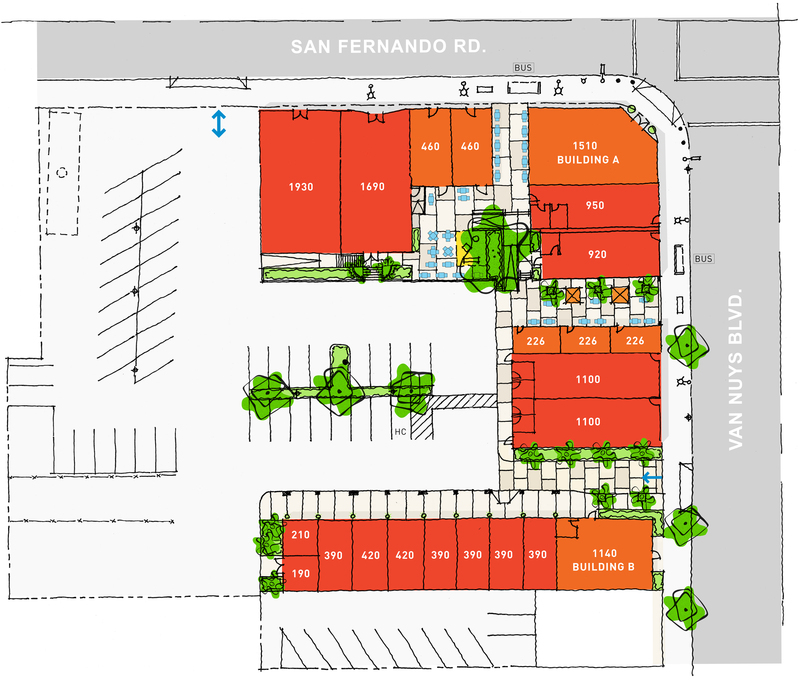 The concept is to turn a collection of largely vacant buildings on the corner of Van Nuys Boulevard and San Fernando Road (totaling 16,000 square feet) into a bustling center of retail and restaurants organized around a series of outdoor paseos. This week’s sketch is of West Valley Towers in Van Nuys, CA. The redesigned visitors entry incorporates an existing tree and provides a new steel trellis, screen planting, and a water feature to direct guests into the project. We occasionally invite guests to contribute to our blog. This week, Toliver Morris – considered by many as the Long Beach Office Expert – has kindly shared his perspective on the need for more creative office space in Long Beach, CA. He and his family reside within the city, and he cares greatly about the community. Toliver can be contacted or followed via his informative website/blog at www.LongBeachOffice.net. As a commercial broker who focuses on helping companies with their office needs in Long Beach and surrounding areas, the question I’m asked most often is: “Is there any really cool, creative, loft-type space?”. Unfortunately, the answer too often is “no” or “very little”. The vast majority of office space in Long Beach (even in cool, old buildings) is boring, generic, uninspired, tired, “vanilla” space – blegh! This week’s sketch features a detail from our Formosa South project. Located at The Lot Movie Studio in West Hollywood, Formosa South is a five story, poured-in-place concrete office building that’s currently winding its way through plan check, with construction slated to start later this spring. The building is the first phase of a larger scale master plan aimed at creating an integrated media, technology, and entertainment production campus on the historic movie studio site. Sketch showing one of our initial ideas for the soon-to-be completed Long Beach Airport Terminal Improvement project. We were selected to design all of the retail and restaurant shops at the new terminal buildings, and we couldn’t be more excited to be involved in this ground-breaking endeavor.